What can I say? This is my 5th Starbucks since I’ve started this project. Sometimes I just need a quick new place that doesn’t require much research or many photos. Since most of us know what a Starbucks looks like, there is only an inside and outside shot. 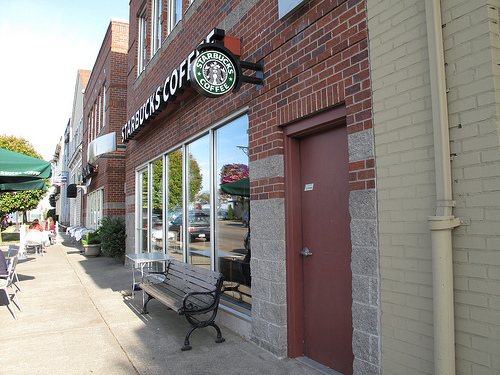 This particular Starbucks is located at 2112 North 30th Street Tacoma, WA 98403 in the Old Town area of Tacoma. It is pretty much a typical Starbucks, clean, friendly, reliable. The space is larger than I expected with a large room in the back. There is outside seating. This entry was posted in Coffee Shops, cafes and bistros, Restaurants, Tacoma, WA State - Pierce County and tagged coffee, Old Town Tacoma, Starbucks on August 16, 2011 by admin.